Canadian Denis Shapovalov advanced to the third round of the Rogers Cup on Wednesday, while fellow countryman Milos Raonic was ousted after rain delays wreaked havoc on the Masters 1000 tournament. Denis Shapovalov didn't hide his disappointment when he saw that his Wednesday afternoon match against Fabio Fognini had been moved from centre court to the grand stand. Turns out the switch actually benefited him in the end. 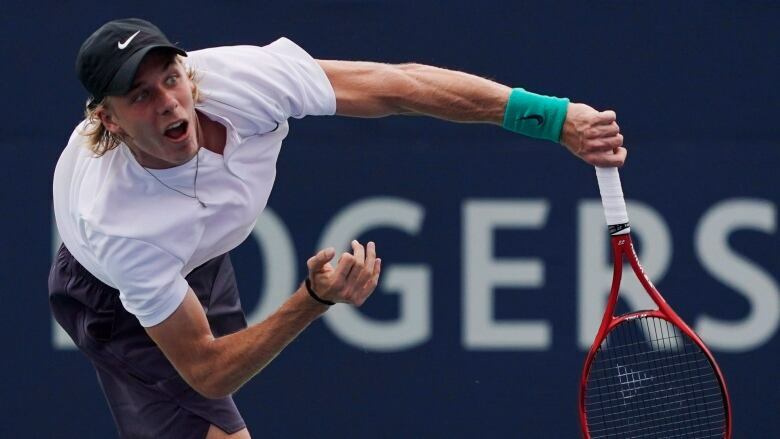 Buoyed by an enthusiastic crowd on the smaller venue, Shapovalov advanced to the third round of the Rogers Cup by defeating the 14th-seeded Italian 6-3, 7-5 in a match that was delayed for hours and interrupted in the first set by heavy rains. "I know how many friends wanted to come out today and how many fans were looking forward to seeing me on centre court this week," said Shapovalov, who grew up in nearby Richmond Hill, Ont. "Unfortunately with the rain delay it got moved to the grand stand. It was a little disappointing in that sense. "But the crowd on the grand stand, I think they helped me a lot because it was so ecstatic, it was so energetic because it's so compact and it actually bothered Fognini quite a bit, especially toward the end. "So it really worked in my favour. I really enjoyed myself out there." Shapovalov fired nine aces and won 82 per cent of his service games in a match that, minus delays, lasted just one hour 22 minutes. He also broke Fognini three times in the second set — two to erase a 4-0 deficit and one more to go up 6-5 — before holding serve for the victory. The 31-year-old Fognini spouted some words towards an energetic Shapovalov during the changeover after his third break, but Shapovalov said he didn't understand him. "Honestly I'm not sure what he said. It was really loud and unfortunately I don't speak Italian yet so maybe you guys can roll it back in slow motion or something," the teenager said with a smile. "But I just told him if he has a problem we can discuss it after. I just tried to stay focused." At No. 26, Shapovalov is the highest ranked Canadian in the men's draw. He rose to prominence last year with a stellar run at the Rogers Cup in Montreal that ended with a semifinal loss to eventual champion Alexander Zverev. Shapovalov downed France's Jeremy Chardy in straight sets in the first round Tuesday night in front of a packed and supportive crowd at centre court that included Edmonton Oilers captain Connor McDavid. He will face Robin Haase of the Netherlands in the third round on Thursday. Fellow Canadian Milos Raonic, meanwhile, saw his tournament end with a 7-6 (4), 4-6, 6-1 loss to No. 41 Frances Tiafoe of the United States in a match that was also delayed and interrupted by heavy rain that wreaked havoc on the day from the outset. The opening match — a 6-3, 6-4 win for four-time champion Novak Djokovic over Canada's Peter Polansky — was delayed by approximately one hour. The rain started up again with a fury after Djokovic's one-hour, 25-minute victory, causing further delays and the venue switch for Shapovalov. Shapovalov sent out a sarcastic tweet after the move was announced but quickly deleted it. "Got moved to grand stand .welldone .homeevent," Shapovalov wrote, adding the clapping hands emoji. He stood by his words after the match. "The main purpose of the tweet was because I was disappointed, obviously not for myself, but because there was so many fans and friends that wanted to come watch me on centre court and they weren't able to," Shapovalov said. Raonic, from nearby Thornhill, Ont., had his match against the 20-year-old Tiafoe interrupted in the second set with the score tied 3-3. Raonic came out firing after the delay, breaking Tiafoe's serve then holding to force a third set. But the Canadian wilted after that, losing serve twice in the third set to knock him out of the tournament. "I just played sort of the wrong way," Raonic said. "I rushed a little bit on my serve, didn't take the time I needed and just became a little bit too predictable. "And [Tiafoe] stepped up. He played well." Top seed Rafael Nadal of Spain opened the evening session on centre court with a 6-2, 6-3 win over France's Benoit Paire. Montreal's Felix Auger-Aliassime, competing on his 18th birthday, followed with a three-set loss to Russian qualifier Daniil Medvedev. Auger-Aliassime was coming off the biggest win of his career, downing No. 18 Lucas Pouille of France in straight sets on centre court on Tuesday. It was just the second Masters 1000 win for the 133rd-ranked Auger-Aliassime. Medvedev won 3-6, 6-4, 7-6 (9). Toronto's Daniel Nestor — the oldest player at the tournament at 45 — and Vancouver's Vasek Pospisil lost to Feliciano and Marc Lopez 6-7 (8), 6-2, 10-6. Nestor is retiring following the Davis Cup in September. He will have played in 30 Rogers Cups since his first as a 16-year-old wild card in 1989. Earlier Wednesday, tournament officials announced Argentine star Juan Martin del Potro had withdrawn from the tournament with a left wrist injury hours before his scheduled match against Haase. Haase instead faced veteran Mikhail Youzhny, defeating the Russian 7-5, 6-2. In other second-round action Wednesday, second-seed Zverev defeated American Bradley Klahn. Stan Wawrinka, John Isner, Ilya Ivashka, Stefanos Tsitsipas and Wimbledon finalist Kevin Anderson also advanced to the third round.